Thank God for faith which reminds me that nothing can harm me. This does not mean that storms will not come. This means that I am sheltered. Man appoints, God disappoints. Cervantes said it, I live it. I awakened this morning full of the best laid plans. I rose at six to shower, do my hair (locs that energy and some time), prep Sunday dinner, finish some papers for an afternoon meeting, make more coconut scones (the last batch was divine) and then walk the dog and get the family ready for Sunday worship. The best laid plans….no more than 5 minutes into my shower (fortunately before I began washing my hair), we had a plumbing emergency. Needless to say, my plans were dashed for an impromptu trip to the closest big box home improvement store (all before 8 am). At any point, tears would have been understood. After all, I had such good plans and so much to do. At the very least a tiny tantrum or perhaps an imagined expletive might be expected(nah, never that). Riding to the rescue Batman and Robin style alongside My Beloved (MB), I heard him say the nicest thing. He told me he loved me, particularly at times like these, when the unexpected happens. He encouraged me. I needed encouraging, and God met me (through loving words) just at the point of my need. Thank God I’ve learned to stand fast. Thank God I’ve learned to hold on and break through to get to my blessings. A Christian is always in danger, therefore should ever be on the watch. He should be fixed in the faith of the gospel, and never desert or give it up. By this faith alone he will be able to keep his ground in an hour of temptation. We should be “fixed in the faith.” Fixed. Firmly planted, unmoved by anything. By this faith alone, we can stand fast, sticking in, breaking through to get to our blessings. I (still) believe the most difficult thing for a capable person to do is nothing. If you recognize yourself there...do something. Stay occupied. Do this...your sole responsibility is to lift praises to the Most High King, chill with your attitude (FIRMLY) in check, and watch. He moves to still the storm to a whisper, hushing both the waves of the sea and the fear within you. He moves. We are sheltered. 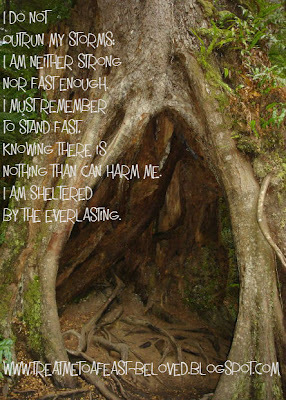 We are sheltered, and there is no need to run away from anything. Rather, we should be firmly fixed in faith, fixed in Him as He moves. That’s all. It wasn’t the day I planned; it was much better. His plans are (always) better. I broke in new running shoes, and have the blessing of this revelation looped through the laces. I will always remember this lesson when I put on those shoes. A steadfast reminder to stand fast-another reminder that God is good.